Software projects have a reputation for being difficult to forecast and control. Agile development can help to ensure that costs do not exceed a limit by working to deliver as much value as possible within a defined budget. The final scope delivered cannot be guaranteed but financial control may be easier. Many straightforward software projects are still implemented using traditional methods, loosely referred to as the waterfall approach. Projects delivered in this way are constrained to meet a defined scope. They place stress on owners and developers if the available funds are exhausted before the scope is complete. The use of an agile, waterfall or a hybrid approach is secondary to deciding whether to embark on a development in the first place and how much funding to provide. The path taken by an agile development, and even what it ultimately will deliver, might be adjusted as the work is underway. However, there must still be some sense that the funding available is commensurate with the capability that is expected to be delivered. 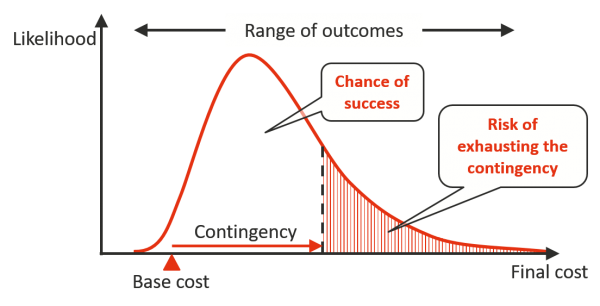 Methods used to analyse cost uncertainty in other kinds of projects are applicable to software projects. However, some of the features of software projects affect the emphasis given to various parts of the analysis, and it is useful to be clear about what these are and how we can handle them. This note cannot cover every aspect of software project cost risk. It outlines some of the common issues that affect software projects and illustrates how they can be included in an analysis. The proportion of the total cost associated with human effort is generally far higher in software projects. Despite having been surrounded by and dependent on software for decades, the fact that software deliverables are intangible still colours the way software projects are managed. Senior stakeholders are more inclined to request disruptive changes to a software development than they are to suggest rerouting a freeway or relocating a process plant once construction work has started. Some of the forces at work are illustrated in Figure 1. This system might operate smoothly until a project is established to bring about change. Ways that seemingly innocuous and quite legitimate interactions can create challenges for such a project are illustrated in Figure 2. Not shown in this simple illustration are further sources of complexity, such as the existence of multiple centres of power within the organisation each able to exert an independent influence on the work. On a wider front, the services being delivered may span multiple organisations, requiring co-ordination between another set of loosely aligned but independent stakeholders. All these processes can change the priorities driving a system development more quickly than the development can be completed. For more on this see resources dealing with complexity in software procurement. Regardless of the development approach that will be adopted, organisations need to assess the level of funding that will be required to deliver the capability they need. Details of how that funding will be expended might evolve as the work progresses but there needs to be a rationale for releasing funds and allowing work to start. An estimate of costs is required and that estimate will be subject to uncertainty. The following section is not an exhaustive description of all the sources of uncertainty affecting software project costs. It focuses on matters more likely to affect software projects than projects with tangible deliverables, which have been discussed in several earlier papers. As with any project, there is often uncertainty about market rates for goods or services, including professional effort. Budgetary quotations provided by suppliers may prove to have been optimistic. The supplier might not have disclosed constraints associated with the rates they have provided or might not have devoted sufficient time to ensuring that their initial response was comprehensive. Conversely, if they feel confident of winning the business, they might have simply provided standard rates from a price list without considering discounts or other arrangements that could offer a saving. Forecasting the demand that will fall on an IT system is difficult in all but the simplest of situations. At some point in the operation of most IT systems, human interactions play a role. Human behaviour can rarely be understood with great certainty, especially in a fluid social and administrative setting. 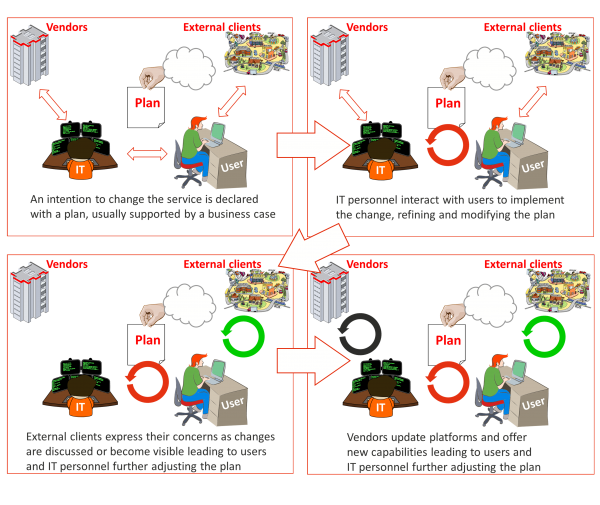 Behavioural factors might affect the level of demand within the planned deployment of a system or lead to pressure to extend the deployment into new areas. 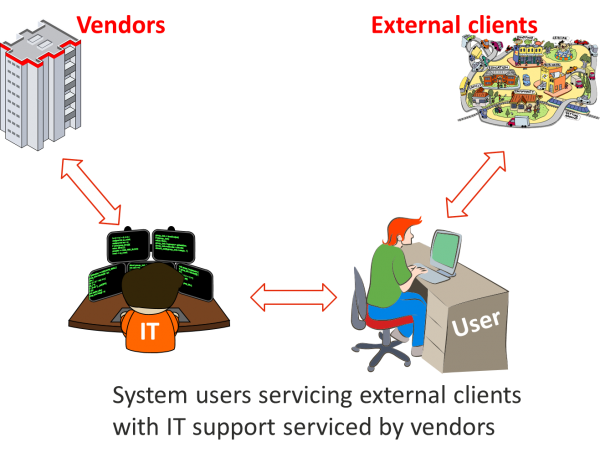 System demand can affect the cost of IT infrastructure, support services, licenses and other charges. It is not unknown for a system to be the victim of its own success and experience stress from higher than expected levels of usage. If this becomes apparent after a project is completed, the costs will fall elsewhere, but if additional demand is foreshadowed during the project implementation then the project budget may have to fund the increased provision. Any knowledge-based work is subject to uncertainty about the size of the task to be completed. This is true of the preparation of designs for physical infrastructure as it is for almost all stages of software projects from requirements capture to acceptance testing. Even if the scale of the overall task to be undertaken is clear, IT projects often require work to be carried out by related entities who are responsible for systems that interact with the one that is being developed or enhanced. Project budgets might assume that these peripheral or interfacing tasks will be funded as part of the system maintenance activities of those entities or by their own project funding. It is good practice to capture the cost of all these additional activities in the overall business case for a project, but this is often overlooked. Even if all the costs are captured, control of the funding for work outside the core project often rests with the organisations or business units who are to carry it out. Short-term pressures, difficult working relationships or divergent priorities can result in these additional tasks being delivered late or not at all. In many instances, the only way to make progress is for the core project to fund the work directly and it might not be possible to recover that cost from those who were to have carried it out. The way work is allocated between stakeholders can be a significant source of cost uncertainty. Even if the amount of work to be carried out is well established, the productivity of the personnel undertaking the work may be uncertain. A team that is thoroughly familiar with the end user environment and IT platforms to be used will make faster progress than one that is not, and a team that suffers significant staff turnover will not be as productive as one that is stable. Finally, the resources devoted to project management and administration are usually based on an expectation of the complexity and challenges the project will face. If the work is easier to manage than expected, it might not be necessary to staff up to the planned project management headcount or it might be possible to manage with fewer highly skilled or less expensive staff. Projects that are intrinsically more complex than anticipated, or that run into difficulties in any of the other areas mentioned here, could find they need additional personnel or more highly skilled and experienced personnel than anticipated. Such variations can manifest themselves as a change in the level of effort or as a change in rates. An IT project team’s headcount can rarely be turned up and down at will in response to emerging patterns of over or under achievement on the schedule. The usual pattern is for the headcount profile to be more or less fixed at the level decided during early planning, so variations in scale, scope, productivity and work sharing show up directly as schedule variations. Schedule variations can also arise due to external dependencies on supplier deliveries or regulatory approvals. Internal dependencies with implications for the schedule include the need to obtain approval to proceed, sign-offs on specifications or plans, the provision of specialist resources or the release of funding at key stages in the project. Schedule variations drive variations in overheads such as the costs of the project management team, office space and development or testing facilities. They can also be linked to costs associated with sustaining existing systems that are to be retired when the project is complete. Maintenance contracts and license charges that were expected to cease at a specific time may need to be extended as the project continues past its planned completion date. The bulk of most IT project budgets is associated with professional effort. As outlined in the previous section, direct development effort can be a driver of the schedule because progress is linked to the amount of work to be completed and the productivity of the personnel carrying it out. At the same time, the schedule can be a driver of management and support costs as any change in a project’s schedule affects the duration over which these costs are accumulated. The interaction between effort and duration is often the dominant process in an IT project’s cost risk. This is illustrated in Figure 3. The scale of the project and the productivity of the development team drive the project duration. In turn, the duration drives the cost of overheads. At the same time, the scale of the project and the productivity of the development team also drive the direct cost of professional development effort. The diagram also illustrates interactions between market rates and other features of a project. A simple model for a small project might be no more complicated than shown in Figure 3. It would typically be constructed in a straightforward Monte Carlo simulation environment such as @RISK, ModelRisk or others. Each of the items marked with a probability distribution icon would be represented in a model by a distribution function. 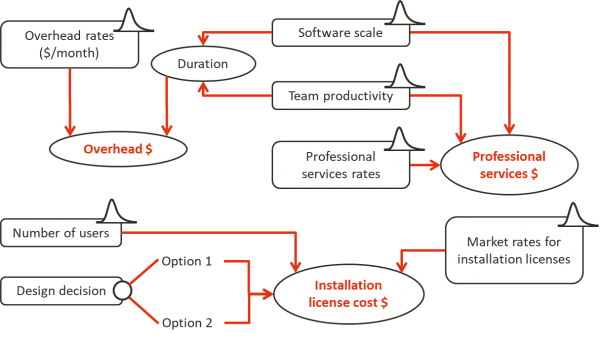 The outcome of the design decision, such as a choice of deployment platform, would be represented by the probability of each option being selected and the costs associated with each option. Where factors are combined, simple algebraic relationships can be used to represent their net effect. This is illustrated in Figure 4 for the simulated professional services (PS) cost. The Δ terms represent the relative variation in the factors shown in their subscripts and PS0 represents the initial estimated professional services cost. Each of the distributions in Figure 3 represents the combined effect of the multitude of small factors that can influence the actual value of the quantities used to make an initial estimate of the cost. It is not necessary to extract from the estimate any specific values of the productivity or scale of the job. All that is required is to consider by how much any variations in productivity, scale or other factors could alter the costs that they affect. This is a judgement that estimators and subject matter experts are able to make. These relationships are readily represented in spreadsheet based modelling environments such as @RISK and ModelRisk. 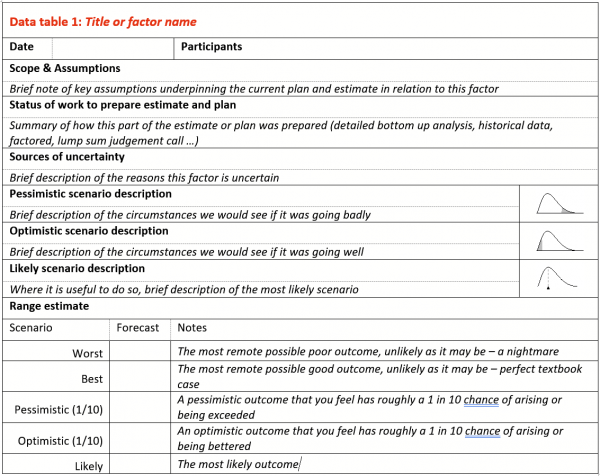 There is a well-established method for assessing and quantifying uncertain values, illustrated in Table 1 and Figure 5. This way of gathering information helps to minimise optimism and anchoring bias that can lead to unrealistic assessments. The characteristic output of a Monte Carlo simulation cost risk assessment is illustrated in Figure 6. 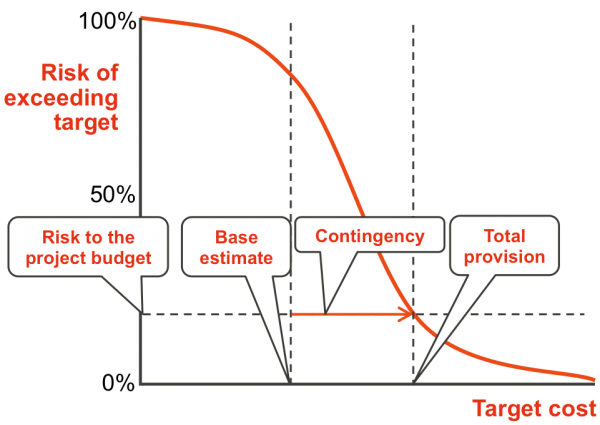 This shows a cumulative distribution of the possible cost of a project and provides a means by which decision makers can set a contingency amount that will provide an agreed level of confidence that the project will have sufficient funding. Software project cost risk has the same underlying characteristics as cost risk in projects from other sectors. While human resources and effort are an important part of most construction, infrastructure and heavy engineering projects, they dominate software projects. Schedule risk interacts strongly with cost risk. The schedule is affected by uncertainty about the amount of work to be done and the productivity a team can achieve, which also affect direct costs. In turn, duration uncertainty affects overhead costs and sometimes the cost of maintaining legacy systems. For small projects, unless their timescale is critical, the interaction between effort, the schedule and overheads can often be represented realistically in a relatively compact model. The keys to success in software cost risk analysis are to craft a model that links uncertainty to the cost realistically and to avoid bias in the assessment of modelling inputs. These issues are discussed in more detail in other Broadleaf publications including one that focuses on how models are structured. Schedule duration variation driven by progress of the development team, external and internal dependencies.